Rehabilitation is beneficial for older animals with decreased mobility and performance dogs recovering from a sports injury. Physical therapy also helps with animals that have undergone surgery, have chronic joint conditions, or pets that have had a musculoskeletal or neurological injury. Improving your pet’s quality of life by decreasing pain and increasing strength, endurance, flexibility, coordination, and balance. 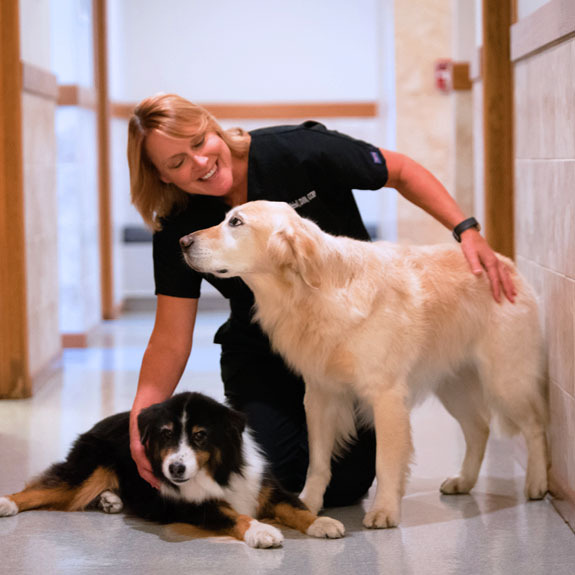 Dr. Lori graduated from the University of Tennessee’s Canine Rehabilitation Program in 2008 and now provides canine physical therapy services at Chisholm Trail Animal Hospital. Most recently, Dr. Lori attended the Canine Rehabilitation Symposium in Orlando, FL at the North America Veterinary Conference and is a member of the American Association of Rehabilitation Veterinarians.